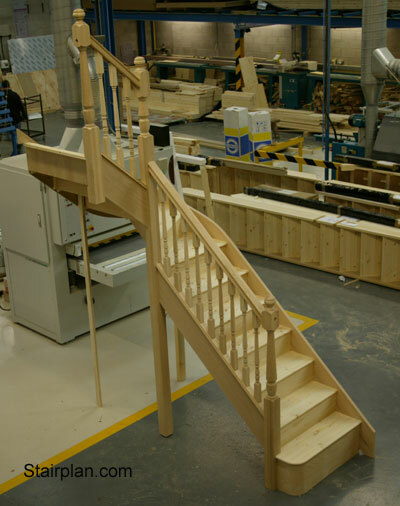 Stairplan manufacture a complete range of Wooden Staircases take a look at a small selection of the staircase designs we offer on this page or explore our vast site a little deeper. 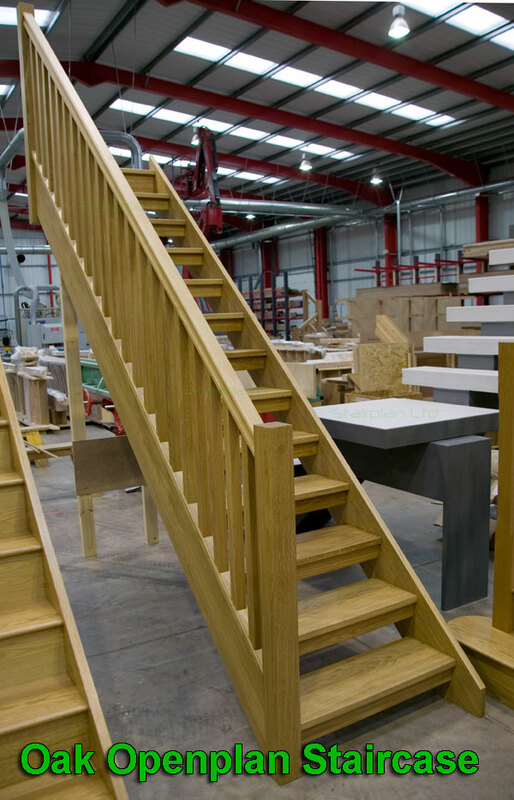 Our staircases can be fully tailored to your dimensions and crafted around you, just let us know your stair requirements. 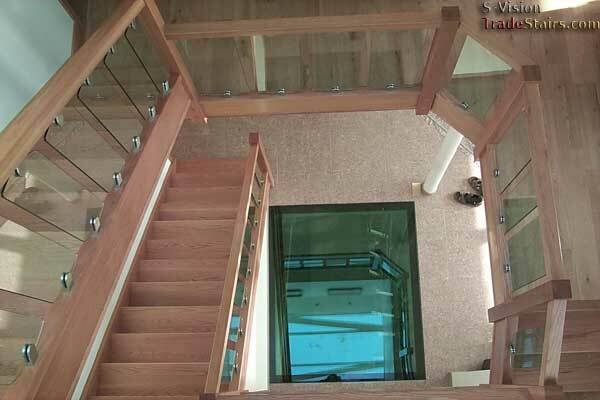 Above you can see one of our luxury X-Vision staircases in american black walnut. 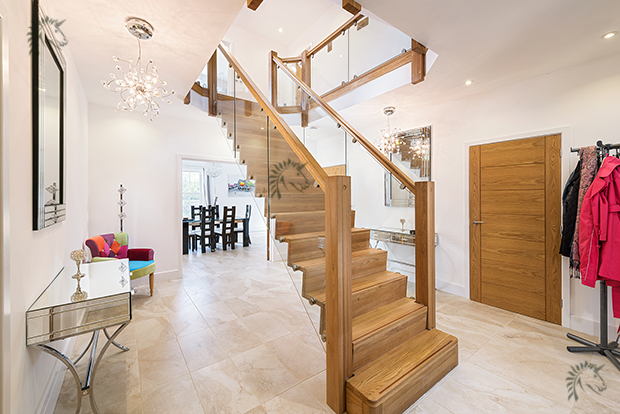 The X-Vision staircase design shown here in oak is a popular choice in the modern architectural self build project, clean lines and chunky section sizes make sure this staircase make the right first impression. 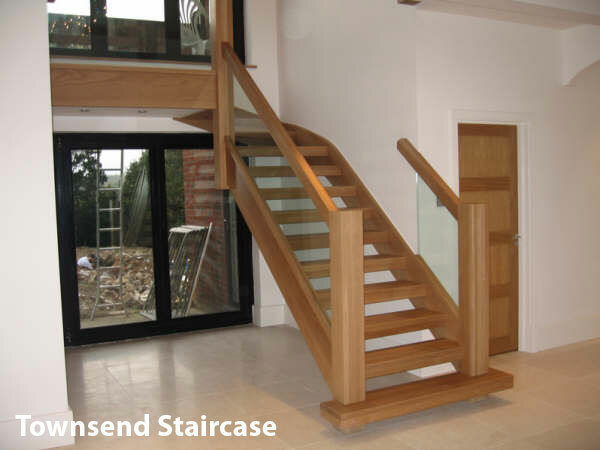 The Z-Vision staircase above seen here as a central feature staircase in Select Oak with glass balustrades to both sides. 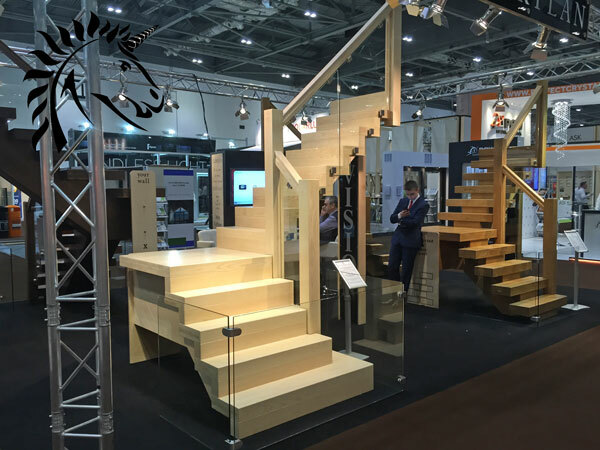 Here you can see our new V-Vision Staircase, shown here in selected white ash the V-Vision staircase is a new model added to our Vision range of stairs at Grand Designs Live in the London Excel May 2015. 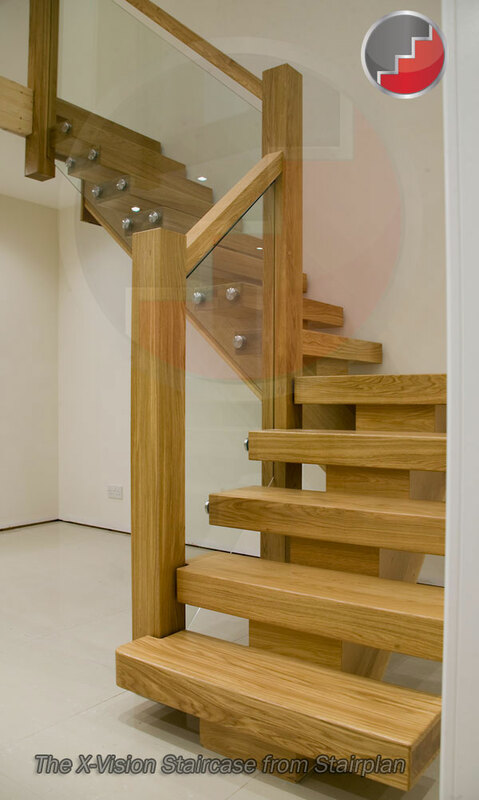 Above - Our Houston Oak Staircase - The Houston staircase offers you a quality oak staircase contruction with contemporary glass balustrade and offers great value for your money. 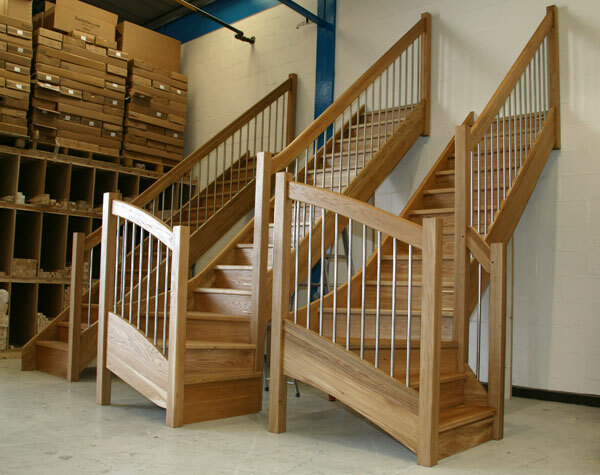 Our Oak Townsend style Staircases are build to the highest standards. 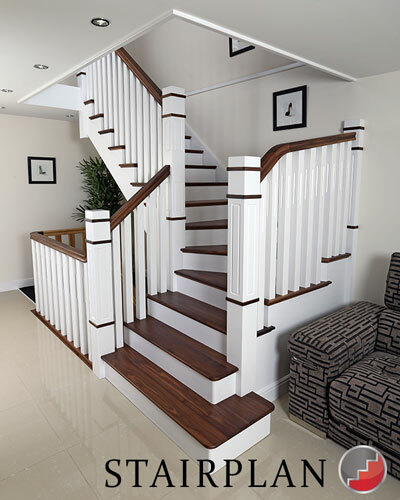 Visit our Staircase showroom to see our unrivaled quality and find the right staircase design for your home. 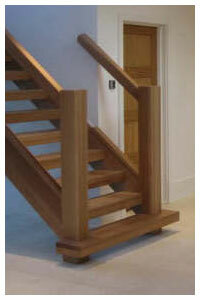 Our Townsend staircases are offer with Glass Balustrade or 55mm Oak Square Balusters. 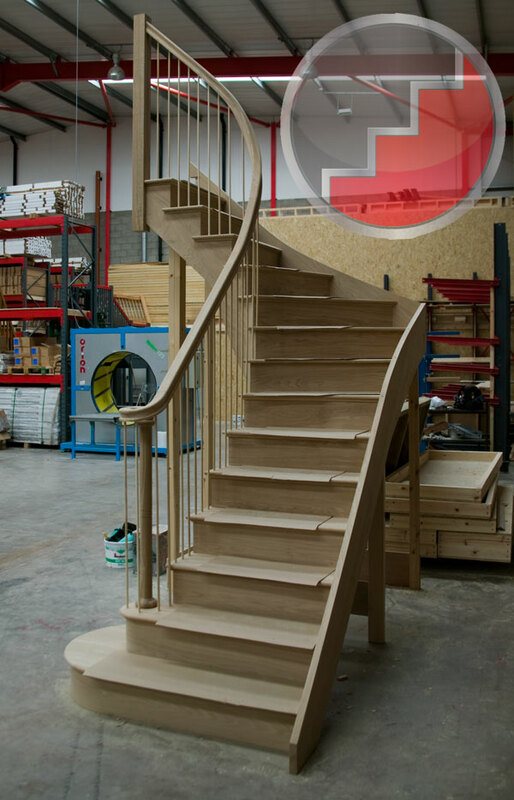 We can offer our staircases in virtualy any layout, look at our library of staircase layouts and call us for a quick quotation. 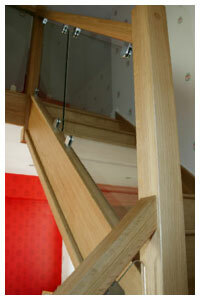 If you need a staircase for outside take a look at our Iroko External Staircases. 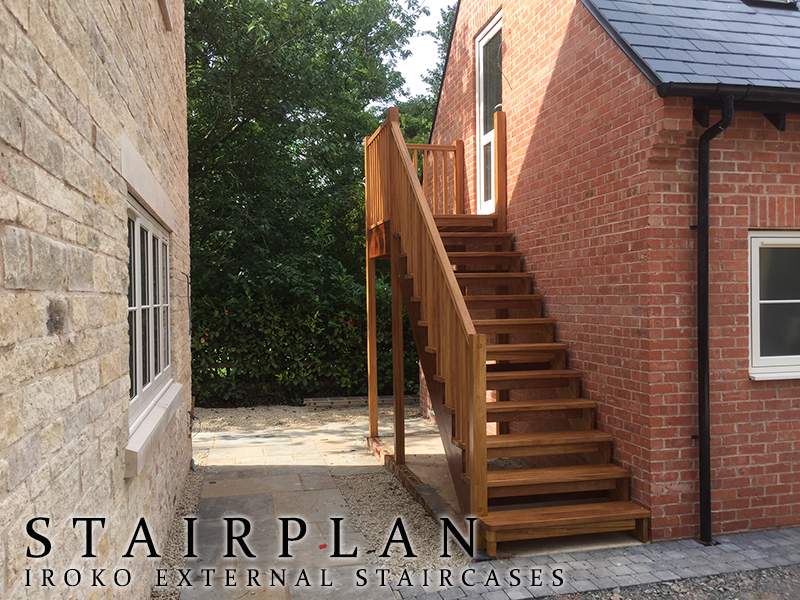 Above - Iroko hardwood external staircase - Openplan construction with a cut string and riser downstand, you can see others on the External Staircase page. 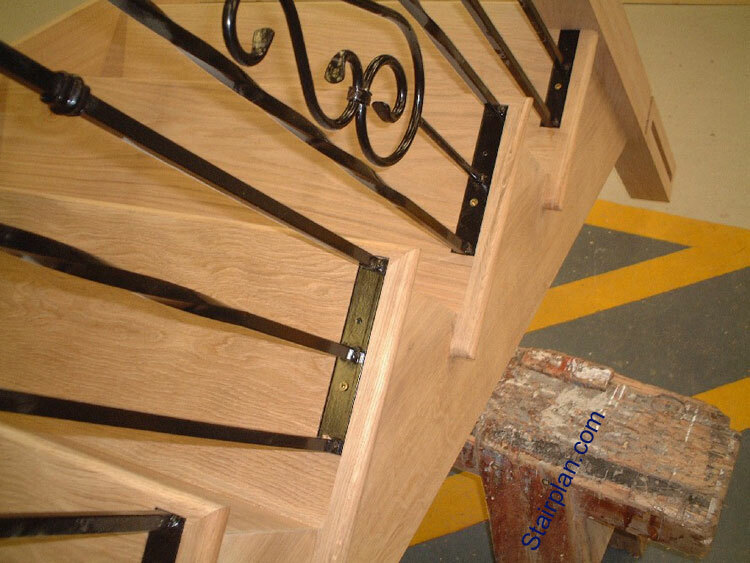 Oak Cut String Staircase - shown here with a Quarter landing layout other options shown here include a Curtail entry step and a Volute detail to the handrail. 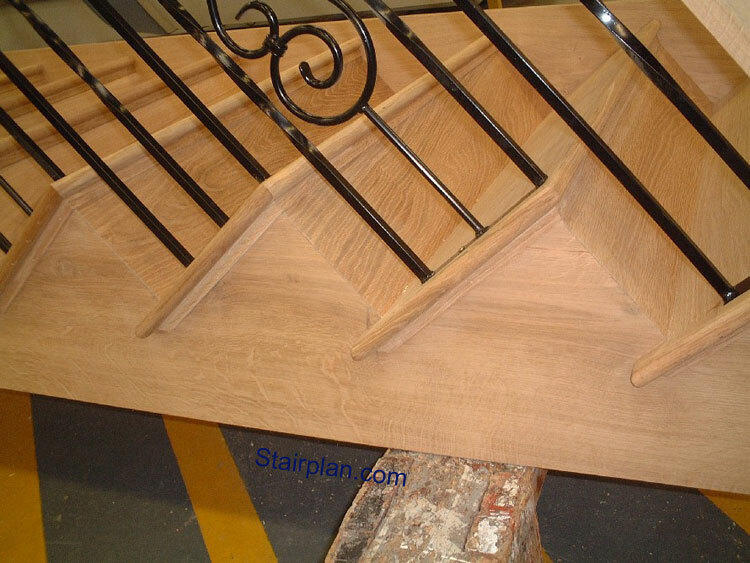 Oak Cut String staircase this staircase has a traditional cut and mitred string detail. Oak Handrail , Oak Georgian Turned Newel Posts , Bespoke Metal Balustrade. 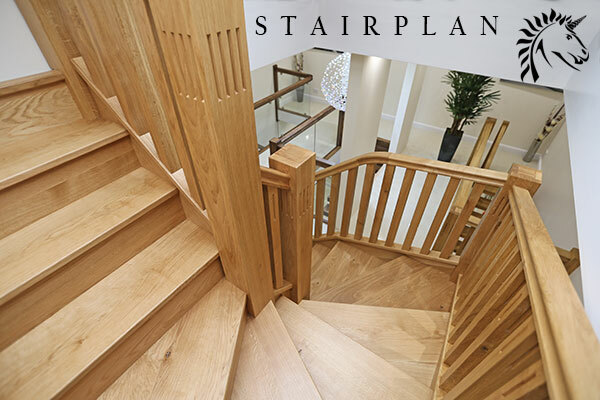 The Prescott Staircase above is a High Specification Oak Cut String Staircase with Bespoke Newel posts and spindles in larger than standard section sizes. Double Going Curtail Entry Step. 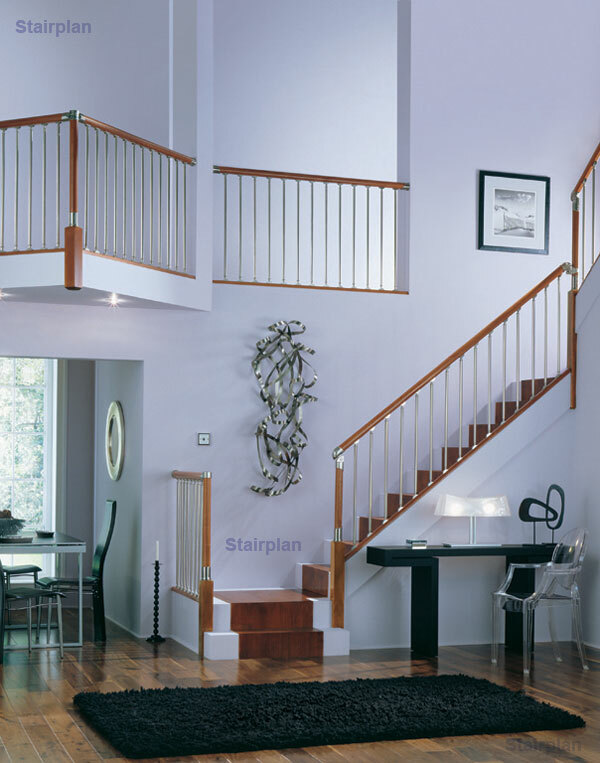 Need a little help - What is a Cut string Staircase ? Above you can see our New England staircase design, this Cut String staircase shown here in white with elegant Black Walnut stair treads this design is on many peoples wish list. 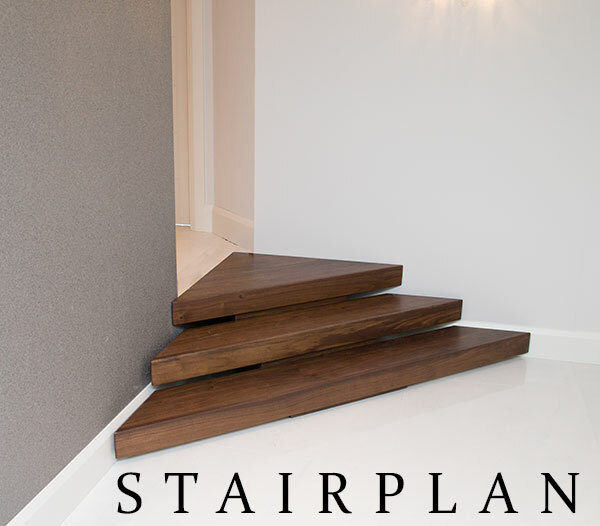 This short walnut X-Vision staircase being set into a corner is a solution for those looking for a premium set of steps when you have different levels to contend with. Here is a Picture of what we call a " Z-Form" Winder Staircase this is where the staircase changes direction on the second winder turn. The programming on these is more complex than a typical double winder staircase where the 2nd turn goes the same way as the first turn. 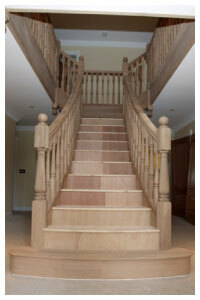 This Craftsmans Pine staircase has been constructed with Engineered Pine Strings, Treads and Risers. 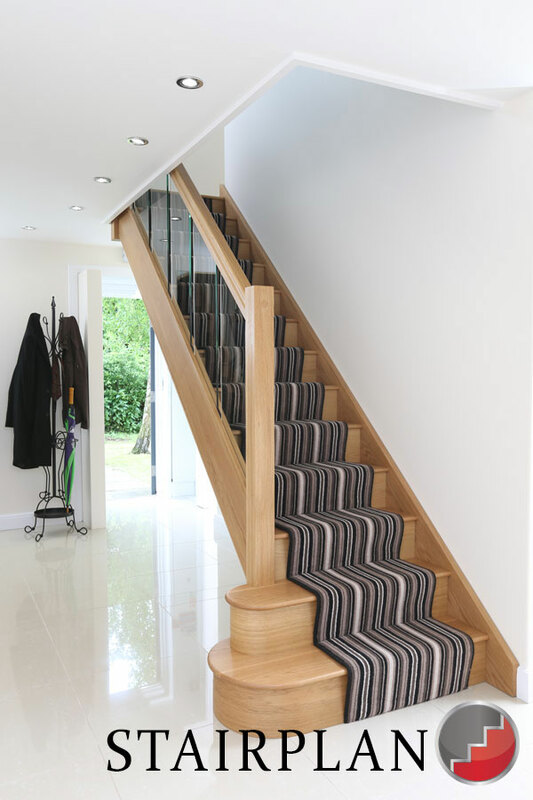 the Staircases above are in American White Oak with the European style handrail the Balusters are Stainless Steel, these are a fairly high specification with 40mm Oak Strings and 40mm Oak Treads. Take a look at the Chunky Harlech Oak Staircase - Ideal for Barn Conversions with its bold rustic style with character oak. When we supply a new staircase with the handrail components the Newel posts are morticed and pre-fitted to the strings, the Handrails and Baserails are cut to size, the Handrails are fitted with our Stelten fixing and the newel posts are pre-drilled to recieve these, the Spindles are pre cut also, This only leaves the Spacers for in between the spindles to be cut on site. The top newel post will require cutting out over the trimmer. 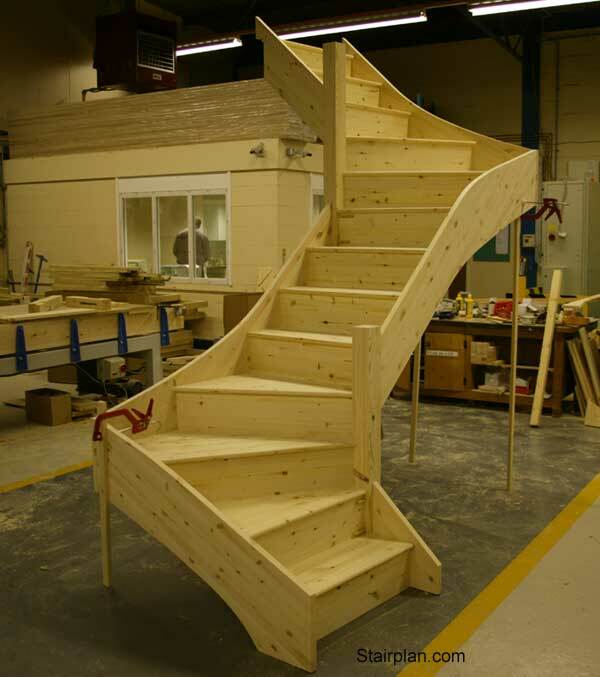 All of our staircases are pre-assembled prior to dispatch to ensure quality at all times. 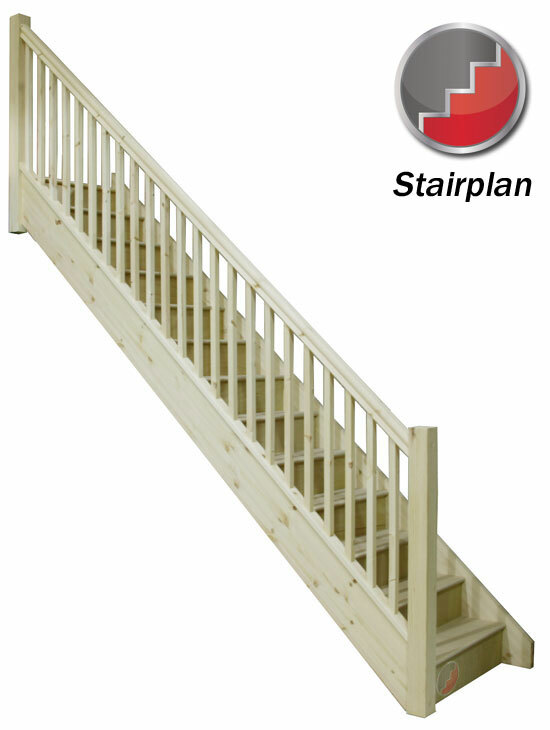 All staircases are assembled as far as possible for delivery and installation unless ordered flat-pack. 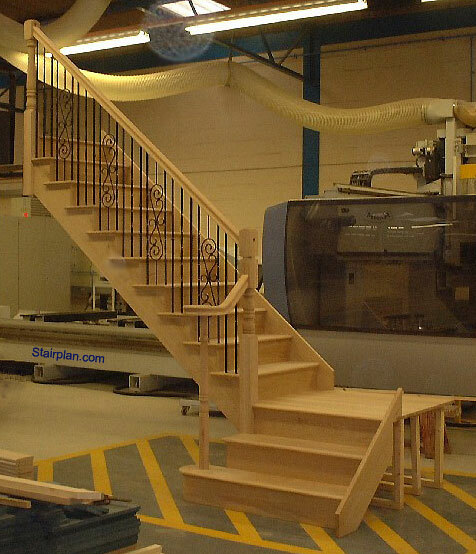 At Stairplan we use the latest in staircase software and 5 axis CNC technology, this helps us to produce Staircases to the highest standards. The software we use enables gives us the widest flexibility available in current staircase software packages. Here is a Oak Open plan winder staircase again with our new European style handrails and Twin Riser safety bars. The Riser safety bars are required to keep the opening between the treads to less than 100mm for the staircase to conform with building regulations. 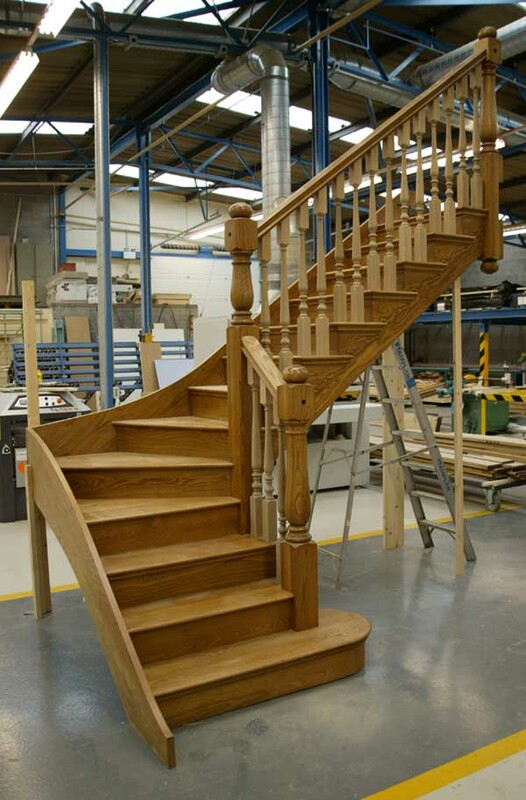 Traditional Oak winder staircase with Turned Newels and Spindles - this Staircase has closed Strings. Need a little help - What is a Closed String Staircase ? Have a look at the staircase drawings we have online, choose the nearest one to the layout you require then phone us with the plan reference and the materials and style you want the staircase in, also let us know if any additional handrails are required on the staircase to the ones illustrated. Like the look of oak but havent got the budget consider a Pine Staircase with Oak Balustrading parts above you can see a staircase with a quarter landing layout and the staircase has painted stair strings and oak stairparts, 90mm Oak turned newel posts, 41mm Oak Colonial spindle, and Oak HDR Handrail, We are very competitive on Oak stair balustrading. 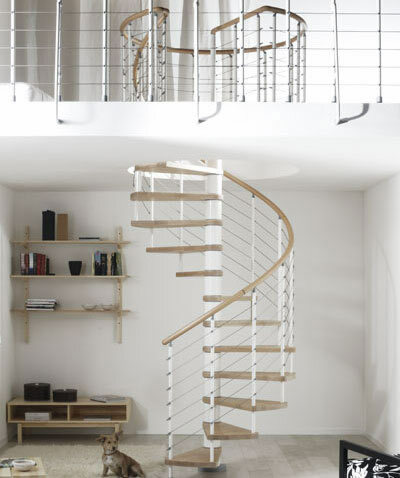 We also offer a selection of Spiral staircases - Above the Kloe Spiral Staircase shown here in White with the light coloured wood option. 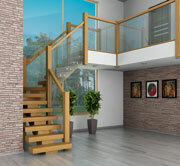 X-Vision staircase - Contemporary luxury staircases. 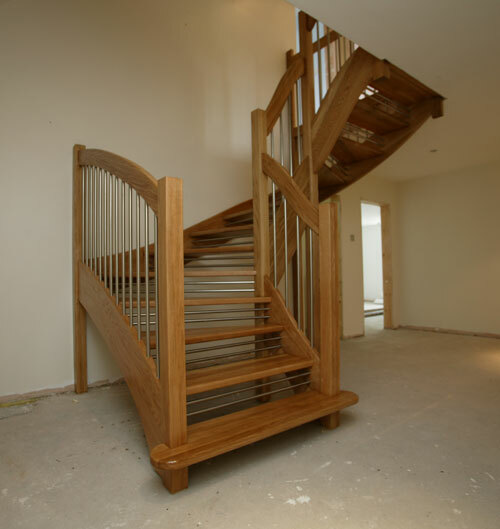 Curved X-Vision staircase in european oak. 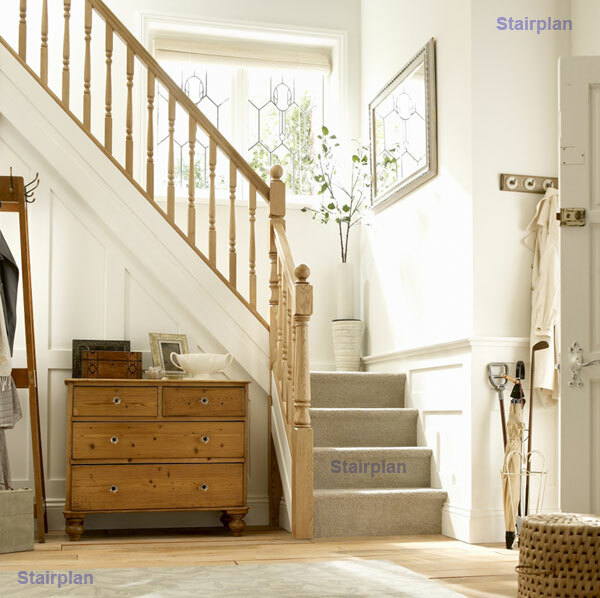 Home|Stairs|Stairparts|Terminology | Workshop |Staircase Plans | Jobs at Stairplan in Telford | Visit the Showroom | Stairs to London..